One of the biggest announcements from Apogee at this year’s NAMM conference was the addition of iOS support for all of their consumer and prosumer audio interfaces. 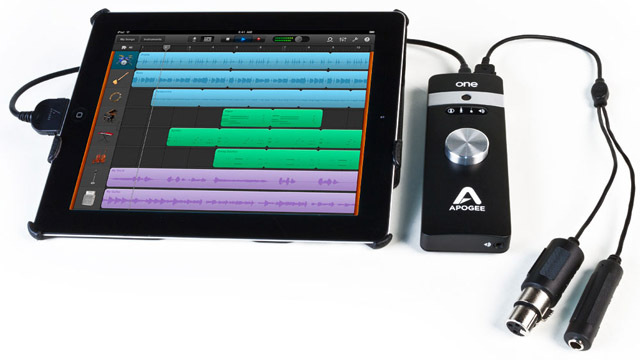 The new Apogee One for iPad & Mac offers high resolution DAC, a highly praised built-in microphone, DC or battery-powered operation for remote recording with the iPad, and USB connectivity that works with all Apple products. This small USB interface delivers stereo sound that is on par with Apogee’s higher-end units and uses the same software architecture. The One offers one quarter-inch (mono) line input, one XLR (mono) mic input, and a multi-function knob on top to control volume and recording levels. The new One is scheduled for release this month with a street price of $349. 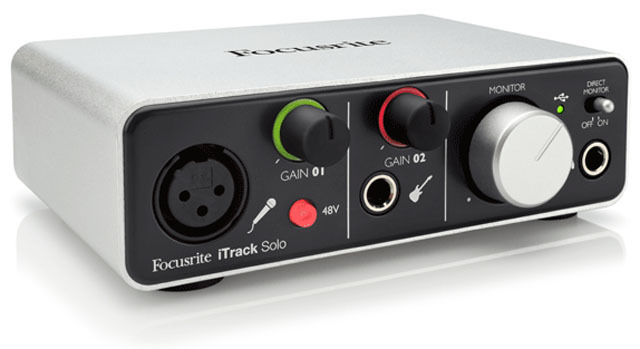 Focusrite introduced its first iOS device last year with the iTrack Solo — a two-channel audio interface created for the iPad. This handy interface offers one XLR and one 1/4-inch instrument input, unbalanced RCA stereo outputs, and a 1/4-inch headphone output. In addition to the iOS device port, the iTrack Solo also features a USB port so it can play nicely with computers. The inclusion of a direct monitor switch rounds out this device, and makes it a solid audio interface for professional recording on the go. The iTrack Solo is currently available for approximately $159. 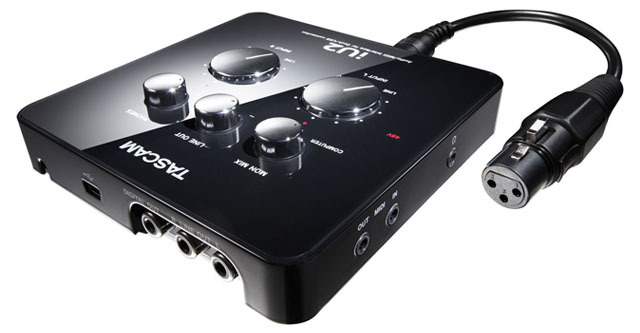 Tascam’s iU2 is another affordable two-channel interface that can be connected to either a computer or an iOS device. It offers XLR and line inputs, low noise A/D converters, direct monitoring, and RCA line outputs. While it seems like a more of the same at first, the iU2 shines with some nice extras such as MIDI input/output, S/PDIF digital output, and a separate instrument level input. It comes packaged with a USB cable, an iOS dock connection cable, and XLR-to-¼-inch conversion cables. The iU2 is currently available for $149. 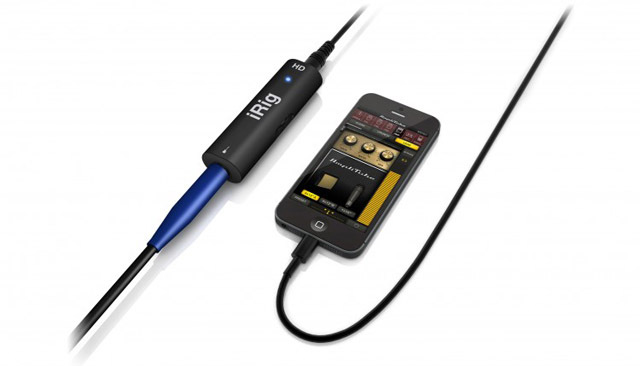 Scheduled for release this month is the iRig HD from IK multimedia. This device is an update of the AmpliTube iRig, an immensely popular device that helped launch the iOS audio craze for guitarists. Like it’s predecessor, the iRig HD offers a single 1/4″ instrument input in a pocket sized package, but upgrades the audio quality and offers 24 bit D/A conversion. For connectivity, iRig HD can use Apple’s Lightning connector, a 30 pin connector, or USB. If you’re only looking to record instruments or line level sources, the iRig is hard to beat at $99. IK Multimedia also offers the iRig Keys, an iPad / iPhone compatible MIDI keyboard. It has 37 keys, pitch and mod wheels, octave switches, and weighs next to nothing, making it a good choice for musicians on the go. Unlike many other portable MIDI devices, the iRig Keys has an iOS port and includes a 30-pin adapter cable, so there’s no need for Apple’s Camera Connection Kit. iRig Keys is class compliant and has a USB port, so it will work with your computer as well. Although it’s not officially an iOS device (meaning it doesn’t come with a USB to 30 pin or Lightning adapter), the Korg microKEY is a solid USB MIDI controller that will work with your iPad or iPhone through Apple’s USB Camera Connection Kit. The microKEY comes in two sizes: the 25 key version sells for about $69 and the 37 key version (shown) is about $99. While the microKEY 25 is slim on functionality with only keys and a joystick, the Microkey 37 takes it up a notch with pitch and mod wheels, and two additional USB ports. These additional ports allow the device to act as a USB hub when connected to a computer. The microKEY controllers are available in standard black and white, and in limited edition all black, or black/red. 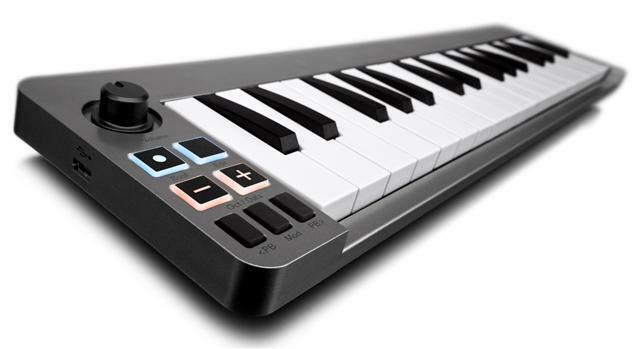 M-Audio’s Keystation is similar in size and weight to Korg’s Microkey, but offers “three assignable controls” instead of pitch and mod wheels. The low-profile design and short length (note the 32 keys instead of 37) make it idea for travel and creation on the go. The device does not come with 30-pin or lightning adapters, but it is compatible with iOS devices by way of Apple’s Camera Connection Kit. The M-Audio Keystation Mini 32 sells for approximately $79. The iConnect MIDI was one of our favorite pieces of technology to hit the market last year and one of the most useful devices we’ve come across for extensive MIDI control with your iOS devices. It’s is a small, powered MIDI hub that sports two sets of your normal MIDI in/out connections in addition to three USB ports in a compact interface. The iConnect MIDI can act as a MIDI hub for your iPad or iPhone (this is the primary function of the device) and creates a seamless connection from the iPad to your computer, or from your iOS device to other pieces of MIDI gear. It also supports multiple MIDI controllers and very low latency, making it an idea hub for multiple types of MIDI connections. iConnectivity explains, ”iConnectMIDI is an enhanced MIDI interface that enables communication between 5 pin MIDI, USB MIDI, Mac, PC and iOS devices–all at the same time.” While the original iConnectMIDI is officially out of production (read on for information on iConnectMIDI 2+) you can still find the device in some stores (Amazon has a few at the time of publish). After the success of iConnectMIDI last year, iConnectivity has announced two new devices that will replace the the popular MIDI hub sometime this year: the iConnectMIDI 2+ and the iConnectMIDI 4+. The 2+ version will sell for about 100 dollars less than the original iConnectMIDI and will offer a new feature: audio through, which will send audio signal through your USB cable along with MIDI information. The 4+ will cost around $249 and will offer four sets of MIDI in/out ports as well as audio thru, and three USB connections. Both devices are scheduled to be released later this year. The Line 6 MIDI Mobilizer II is a compact MIDI interface that plugs directly into your iPad / iPhone’s 30 pin connection port to allow MIDI in and out signals to be routed to your device. Two included MIDI cables allow you to connect any MIDI compatible device. MIDI Mobilizer has been on the market for some time now and Line 6 has been updating the product for compatibility with the latest OS versions. You can find the Line 6 MIDI Mobilizer at music stores and online for around $49. 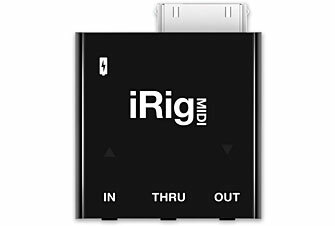 IK Multimedia’s iRig MIDI is similar in size and functionality to the Line 6 MIDI Mobilizer–a thirty-pin connection and micro-to-MIDI cables to route signal. But iRig MIDI offers a couple features that give it the edge over Line 6′s device including a MIDI thru port and a mini USB jack so that you can charge your iPad while using the accessory. The iRig MIDI is available for approximately $69 at music specialty shops.